Media captionAshraf Ghani: "Now in terms of management and leadership things are really falling into place"
President Ashraf Ghani of Afghanistan makes no bones about the challenges facing his country when we sit down for an exclusive BBC interview in his palace in Kabul. "This is the worst job on Earth," he tells me. And it is true there are no shortage of tough issues facing Afghanistan. The most obvious is security. His country has been at war for almost 16 years now. Yet the Afghan president is surprisingly bullish about how long the country will continue to require the support of Nato. Nato troops, he says, will be able to pull out "within four years". Many military analysts will consider that optimistic given that it is only three years since the Nato combat mission ended and the Afghan military took responsibility for the battle against the Taliban and other insurgent groups. About 14,000 Nato troops remain in the country to "train, advise and assist" Afghan forces. The aim is to strengthen them so they can take the battle to the Taliban. Mr Ghani doesn't deny it has been a difficult three years. "We were like 12-year-olds taking on the responsibility of a 30-year-old; but we really grew in the process. Now in terms of management and leadership things are really falling into place." He continues: "Within four years, we think our security forces would be able to do the constitutional thing, which is the claim of legitimate monopoly of power." He expects that some foreign troops will remain in Afghanistan after that period as part of the global fight against terrorism but, when I ask whether he is saying Afghan forces have turned the corner in the fight against the Taliban, there is no hesitation: "Yes," he says. Can Afghan military turn the tide in Taliban fight? The Taliban, he says, had two strategic aims: to overthrow the government or to create two "political geographies", by which he means whole areas of the country where it holds sway. "It has failed miserably in both of these aims," Mr Ghani believes. Whether that is true is debatable. The latest figures from the US military show that the Afghan government controls less than two-thirds of the country. The rest is either controlled or contested by the Taliban and other militant groups. What is more, last year Afghanistan lost some 10% of its entire fighting force: about 7,000 Afghan National Army soldiers were killed, another 12,000 were injured, and many thousands more deserted. One reason the Afghan president is so confident is that he believes that the West does not really understand the real nature of the conflict. His government is not fighting a civil war, he argues, but a drug war. "Taliban is the largest exporters of heroin to the world. Why is the world not focusing on heroin? Is this an ideological war or is this a drug war?" asks Mr Ghani. "This criminalisation of the economy needs to be addressed." So what is the ultimate aim, I ask. "A peace agreement with the Taliban," he answers without a breath. "The whole aim of the strategy is to provide the ground for political solution and a political solution is a negotiated solution. It's imperative that the people are given a chance to live their lives. We have been denied breathing space for 40 years, and in an immense tribute to our people for their resilience, any other state would've been completely broken." 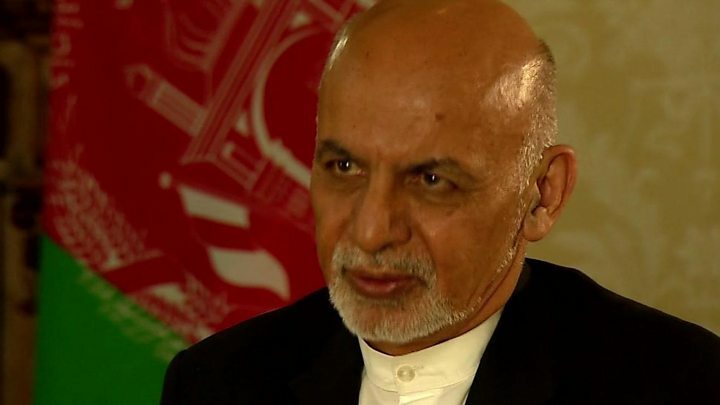 Mr Ghani is full of praise for US President Donald Trump, who finally announced last month that his government was ready to stay in Afghanistan indefinitely. Withdrawal, said Mr Trump, would be determined by "conditions on the ground and not arbitrary timetables". The US president also said he would send a few thousand more troops to support the current Nato mission. In return, Mr Ghani says he plans a complete overhaul of the Afghan government, including redoubled efforts to crack down on corruption. "The first principle of tackling corruption," he tells me, "is that you do not engage in it and you have the will to confront it. Whoever engages in corruption, regardless of affiliation, relationship etc, must be subject to the same law." "A three-star general that I have promoted is now in prison because it was demonstrated that fuel was being stolen," he boasts. "One of the richest men in the country that people thought was untouchable is now in prison. You can ask anyone in the judiciary, I provide full political support." The Afghan president's message is clear: "Self-reliance is not just words, but deeds." And, with two years to go before a general election, he says he doesn't care if the price of his reform efforts is his presidency. "If election is your goal, you're never going to engage in reform. Reform has to be your goal. Election is the means. You run for office in order to do something, not in order to perpetuate yourself. Politicians have become extraordinarily conservative, but our times require imagination and bold action."